The car audio system is a vital component in a vehicle’s interior and overall driving experience. Music keeps you entertained when you get bored while stuck in traffic and it gives you relaxation on a long trip. Most car manufacturers have made a stereo standard in all their models. Audio systems have come a long way, so much so that we cannot imagine what it would be like if there is nothing to listen to on your drive to work or back home. Each year, the original equipment audio systems in cars keep improving and the competition between car brands have pushed auto makers to continue making their sound systems better and better. However, car owners (especially audiophiles like you and me) will never be satisfied with a stock stereo. 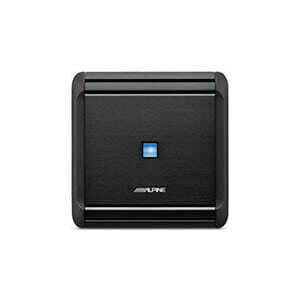 Aftermarket sound systems are here to satisfy the need of every consumer whether they seek sound clarity or extra bass. It’s undeniable that a better sounding stereo offers a more involving experience. With the right setup, you would be smiling all the way to work, going home or on a drive to a holiday destination. One way to enhance the listening experience in a car audio system is to add a 4 channel amplifier. Basically, the car audio system has three main components: the head unit, the amplifier, and the speakers. The head unit is used to control the master volume and the audio source. It contains the radio tuner, CD player and amplifier. Speakers turn electrical signals into mechanical energy, making the speaker cones move forward and backward, creating sound in the process. What is An Amplifier For? An amplifier can be described as a device that is designed to boost electric signals in order to increase the power of an audio system. 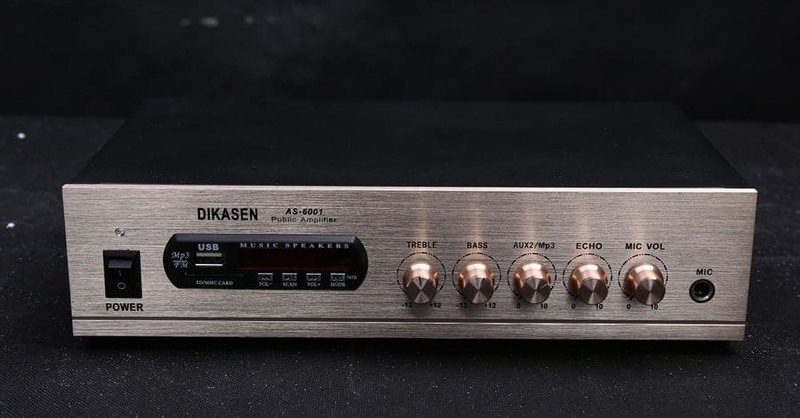 Whether the source is the radio, CD/DVD player or auxiliary connection, the amplifier will increase the signal strength so that it will be powerful enough to drive the speakers. 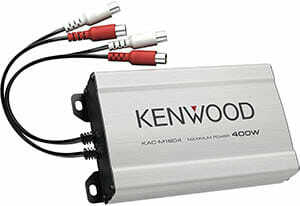 An external 4 channel car amplifier has far more power compared to the built-in amp of your car stereo. For now our focus is on the amplifier and how it makes the audio system sound better. The amplifier comes between the head unit and the speakers. It serves as the booster of electrical signals from the source in order to drive the speakers and make the sound audible. Of course the head units come with amplifiers built in but car stereo manufacturers have to contend with packing so many components in one small space so it will fit in a dashboard. This results in amplifiers having an output of 10 watts per channel on average. You can upgrade your sound system with four channel car amplifiers and make it possible to set up a subwoofer or upgrade your speakers. The clean power source required by installing external amplifiers also provide an improved sound quality. If you’re an audiophile or simply want music or videos to be louder than stock, then it’s time to start looking for an external 4-channel amplifier. There are so many brands and models out in the market to make your head spin. In order to narrow down your choices, take your budget and power needs into consideration. Four channel amps range from $30 and go over $200, mostly depending on the brand and specs. When deciding on which product to buy, avoid going for the low-priced ones. You get what you pay for, as they say, and this applies to amplifiers. It’s an investment and you’d rather have a decent product rather than one that could burn out or fail after just a short period. Look at RMS power rather than peak power. Match or exceed the RMS of your speakers. One good thing about a 4-channel amp is that it’s versatile. You can set it up to power the two front speakers and then bridge the other 2 channels to drive a subwoofer. Now that you know the basics of amplifiers and the benefits of the four channel variety, let’s look at top five 4 channel amps GarageChief would recommend. With an ultra-efficient design that can generate a whopping 300 watts of power, the PBR300X4 Punch BRT Ultra Compact 4-Channel Amplifier is clearly the best when it comes to delivering sonic perfection and superb power in a mighty impressive compact chassis. Boasting of the Boosted Rail Technology patented by Rockford, the Punch BRT packs a lot of technological innovations that make this compact amplifier a true gem for cars as well as recreational vehicles. The Punch BRT conforms to the strict standards of CEA-2006 giving you real output power ratings, not overinflated ones. It features a discrete surface mount to improve circuit efficiency. Its dynamic thermal management system effectively manages the heat generated by the unit. This works great with the Punch BRT’s 3rd generation maximum efficiency heat sink application. Protecting the system against speaker wire shorting as well as low speaker impedance is the NOMAD while its Punch EQ2 system allows the seamless correction of acoustical deficiencies. 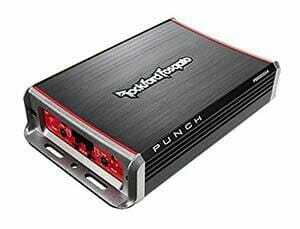 The Punch BRT is rated at 75 watts x 4 at 4 ohms giving an RMS total of 300 watts. Overall, Rockford Punch BRT is one compact yet truly powerful 4-channel amplifier you can put into your vehicle. Boasting of a very futuristic and ultra-sleek design, the MRV-F300 4-Channel Car Amplifier is the one to get if you need high quality, lightweight, premium build, and low power amplifier for your car. Alpine has managed to stay true to its credo of providing its loyal customers only the realistic ratings it could provide so you cannot expect ridiculous power ratings for the MRV-F300. It packs a powerful punch in its small frame and you would think that with all that power supplied to the unit, the heat generated will have to go somewhere. But lo and behold. Even after 24 hours of continuous use at the highest possible acoustic settings, the MRV-F300 remained pretty cool that you can actually still hold it with your hands. Other higher-rated amplifiers boasting of superior cooling technology will often heat up needlessly after only several hours of continued use. But the MRV-F300 never faltered. Best of all, you can just switch on its high level input signal sensor and you can forget wiring a remote wire to have your unit’s signal detected. Talk about power in a small package. The MRV-F300 is rated at either 75 watts RMS x4 at 2 ohms or 50 watts RMS x4 at 4 ohms. If you have a car with a sound system that needs some amplifying without the need for some specialty tools and equipment, then the KTP-445U 4-Channel Power Pack Amplifier is your best bet. The Power Pack is designed to work for both factory and aftermarket receiver units. It features a universal plug which can easily and effortlessly allow you to send signals either from your built-in speaker wirings or from RCA outputs. The power generated is the same as the receiver. What makes the Power Pack so loved by many consumers is its extreme sonic and thermal efficiency. This Class D amp can effectively dissipate heat generated by its operation. Its diminutive size also makes for easy installation. The Power Pack is rated at 45 watts RMS x 4 at 4 ohms. With a maximum power rating at 1,200 watts, the GM-D8604 Class FD 4-Channel Bridgeable Amplifier is the most powerful amp in this list delivering sounds that can shatter the glass of your neighbor’s windows or even the eardrum of a pedestrian. 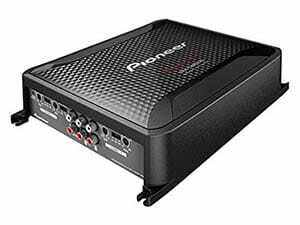 As powerful as the Pioneer amp may be, it is also very compact allowing for super easy and versatile installation. The design is what you would expect from a known brand like Pioneer – premium feel, matte finish, and really high quality look and build. The Bridgeable is rated at 100 RMS at 4 ohms. One of the very useful features of the Bridgeable is its crossover control which makes it very easy to set up the sound range of your speakers. Additionally, because it is CEA-2006 compliant, you can be sure that you get what is clearly stated in its power ratings. The KAC-M1804 Compact 4-Channel Amplifier features an extruded aluminum heat sink to help manage the heat that is generated by its operation. At least, there’s no worrying that your amp will be giving up on you anytime soon. These are 5 of the best four-channel amplifiers you can get for your car today. It is always ideal to check out with your local car audio supplier to try out one of these babies and see which one will best suit your amplification requirements.